The Argus4 is a simple-to-operate, robust, self-contained camera, with fully automatic operation; no control or adjustment is required in use. The camera has been specifically designed to help firefighters to see through smoke, identify and rescue casualties and locate hot spots or the seat and spread of the fire. It has many further applications where temperatures require monitoring, such as preventative maintenance and condition monitoring of equipment. It also provides vision where light is unavailable. Power for the Argus4 is provided by an integral battery pack located on the top of the camera. The camera has a single on/off button with a delayed off operation to prevent accidental power-down during use. The camera will display a start-up screen until a usable thermal image is produced. The Argus4 is constructed from high quality Radel®R-5100, which has been chosen for its strength, resistance to heat, water and impact. Protection from shock is provided by a combination of rugged components, optimum mechanical design and protective bumpers. The camera is sealed to allow short-term total immersion in water (IP67). The camera is supplied with side straps and a removable handle, which provides flexible operation and transfer between users. No end-user maintenance is required other than recharging of batteries and post-use external cleaning with a soft cloth. Electrostatic Discharge - BS EN 61000-6-1:2001 Class B Safety IEC 60950-1 and related national standards Vibration/Shock BS EN 60721-3-2 Class 2M3. Storage - The camera can be stored for extended periods. It is recommended that for maximum effective operational life, the storage temperature is kept between –10 °C and +40 °C (14 °F and 104 °F) and the camera is retained in its carry case when not in use. Dynamic range - -40 °C to 800 °C (-40 °F to 1480 °F) using 3 ranges with auto-switching between ranges. Protection - Over-voltage and overtemperature protection built into the charger and battery. Dynamic Scene Colorisation (DSC) Colorises the thermal image to allow the firefighter to pinpoint the hottest areas within the fire scene. Direct Temperature Measurement (DTM) Displays the temperature of objects within a defined area of the thermal scene. 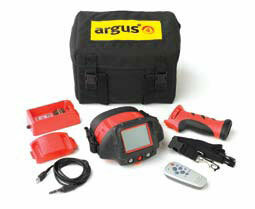 SceneSaveTM Digital Image Capture The Argus4 can capture and store up to 100 images. These can then be viewed or deleted using the remote control supplied. Using the software provided, the captured images can be downloaded to a suitable laptop/PC and exported in *.bmp format. Tri-Mode Sensitivity Microbolometer cameras have two modes of sensitivity, high and low, ArgusTM4 now has a third level of sensitivity for very high scene temperatures to enable clear imagery at all temperatures. Customisable Start-up Screen Brigade logos or station names can be added to the start-up screen for asset tracking and/or personalization of the camera. Ambient Temperature Measurement A sensor fitted to the front of the camera, which measures the ambient temperature of the local environment. The temperature is displayed on the viewing screen. Time and Date The time and date is displayed at the top of the viewing screen. Remote Control The Argus4 is supplied with a remote control that allows the end user to adjust LCD settings, set the dynamic scene colorisation and set the time and date. Stored images can be reviewed and deleted. Power for the Argus4 is provided by an integral battery pack located on the top of the camera. The camera has a single on/off button with a delayed off operation to prevent accidental power-down during use. The camera will display a start-up screen until a useable thermal image is produced. All Argus4 cameras are constructed from high quality Radel®R- 5100, which has been chosen for its strength, resistance to heat, water and impact. Protection from shock is provided by a combination of rugged components, optimum mechanical design and protective bumpers. The camera is sealed to allow short-term total immersion in water (IP67). The camera is supplied with side straps and a removable handle, which provides flexible operation and transfer between users. No end-user maintenance is required other than recharging of batteries and post-use external cleaning with a soft cloth. 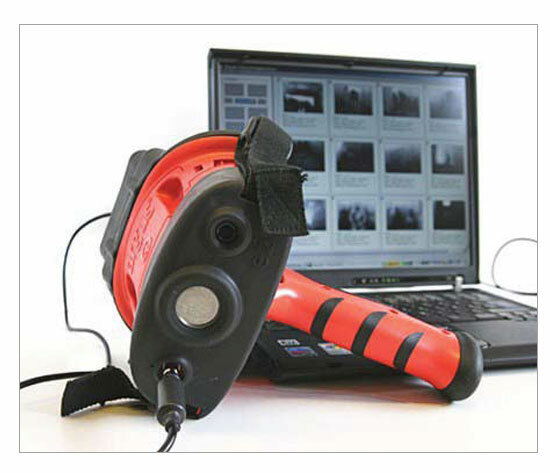 Temperature sensitivity modes are used to expand the dynamic temperature range of the thermal imaging cameras. Argus4 cameras are unique in having 3 modes, rather than the standard 2, which further increases the viewable temperature range up to 10000C. The Argus4 camera automatically selects the most suitable mode for creating the clearest and most detailed image possible. The cameras mode change is seamless to the user, all colour schemes remain the same and without the loss of detail “whiteout”, which is common in other firefighting cameras. A green M on the camera’s LCD screen indicates that the Argus camera is in the high sensitivity mode. The LCD screen displays a clear and detailed image. The camera selects this mode when the temperature of objects in the camera field of view is between -40°C and +150°C. An orange M on the camera’s LCD screen indicates that the Argus camera is in the low sensitivity mode. The LCD screen displays an image that is slightly less detailed than that when the camera is in the high sensitivity mode. The camera selects this mode when a significant area of the scene has an average temperature above +150°C but below +400°C. 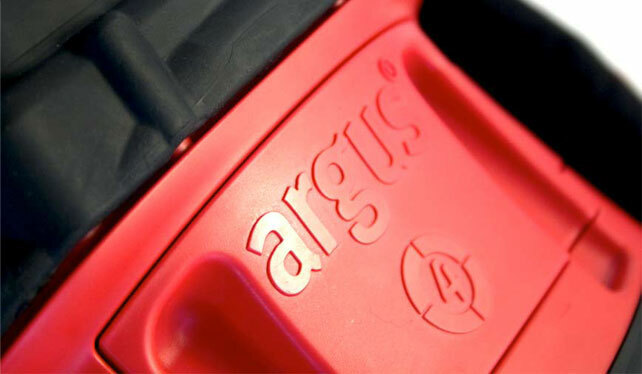 A red M on the camera’s LCD screen indicates that the Argus camera is in the extra low sensitivity mode. The camera selects this mode when a significant area of the scene has an average temperature above +400°C. This enables the viewing of very high temperatures of up to 1000°C (800°C for the Argus4 and Argus4 Lite). The Argus4 provides the end user with a selection of colour palettes that colourise and helps to interpret the thermal image, these allow the user to pin-point the hottest parts of the scene. There are 13 different colour palettes on the Argus4. For the Argus4, colour palettes are selectable by either the remote control or the supplied customer software.. Once set, the camera will always start up in the selected colour scheme. 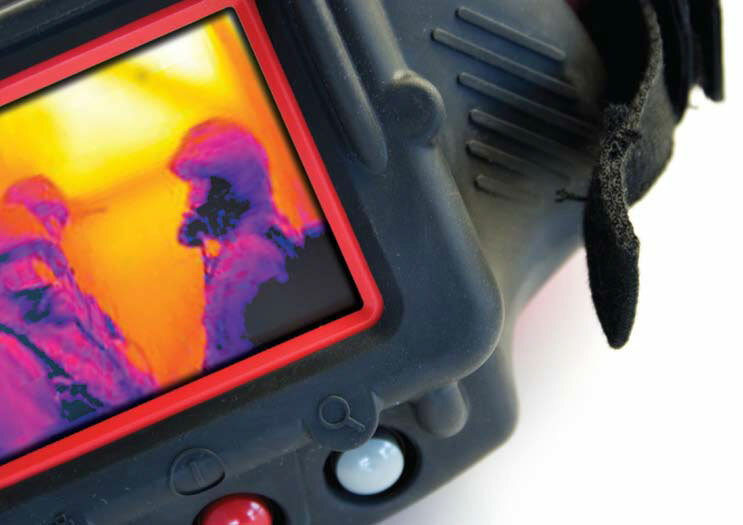 The Argus4 provides the firefighter with two colourisation modes that provide an immediate indication of temperature. Colour is gradually introduced into an otherwise monochrome image when the scene temperature goes above 150°C saturating at 660°C. The user has a choice of either red or soft red, the latter introducing yellow at 150°C saturating at 400°C where red is then introduced saturating at 660°C. Unlike other cameras, the relationship between the displayed colour and scene temperature is fixed and remains the same in all camera sensitivity modes. Argus cameras are equipped with a x2 zoom as standard, with some models featuring a x 4 zoom. SceneSave feature allows the user to download images and colour change pallet.